Your branding tells a story about who you are, why you are holding the conference and what attendees can expect. We will work with you to turn that story into the perfect set of colors, images and logos for your organization and/or event. Already have a design for your event? No problem. We will work with your team to transform your design into a web-friendly format. 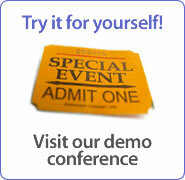 Develop conference brochures, sponsorship brochures etc. Visit our portfolio for some examples of our work.